Melbourne’s Antiskeptic have announced a huge national tour to accompany the release of their third album Stare Down The Ocean. True to the form of hard-working, old-pro road dogs, these guys aren’t doing things in half measures. 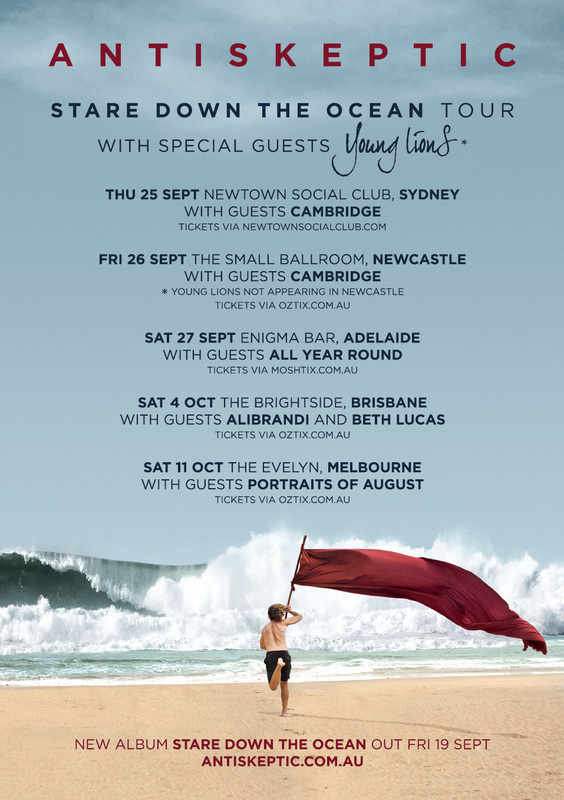 The tour takes on Sydney, Newcastle, Adelaide, Brisbane and Melbourne and will see the four-piece stir up ALL of the feelings with their carefully crafted alt-rock jams. Grab some friends and simultaneously reminisce and rejoice in some of the best local tunes you’ll hear this year. Stare Down The Ocean's lead single Hey Dissident has already seen love from triple j’s Short Fast Loud as well as recently hitting rotation on Rage. The video for the track, a melodic jam with a slow-burning build to boot, is a homage to Back To The Future and precedes a much anticipated crowd funded clip for their follow up single. 2014 has seen Antiskeptic return after six years on the bench. Hard work, determination and a resilient attitude have seen the band return to top form, in time to unleash their aptly titled, epic third album Stare Down The Ocean. The LP will be released independently on Fri 19th September.